I have a confession to make. I love to sunbathe! BUT not very often. I only sunbathe before (to get a nice glowy tan) before I go out for a special occasion. This tanning oil works like a charm. It helps you soak up the sun and has a nice summery scent to it! The oil also makes my skin soft and supple. During the summer, I like to wear body mists versus perfume just because it's more lighter and I feel it's not too overwhelming. The summer heat can be overwhelming in Texas and so I like to keep things simple and light during the summer. The hot weather is already heavy on us as is lol. This particular scent is composed of water lily and pink currant. It's a light scent but oh so sweet! This is my perfect summer scent! I love to throw this in my purse with me for when I am on the go. Vaseline products were a staple in my mother's beauty regimen. My mother had the most amazing skin. She aged so beautifully and I've witnessed all of the products that she's used and so naturally this product is a part of my skincare regimen as well. 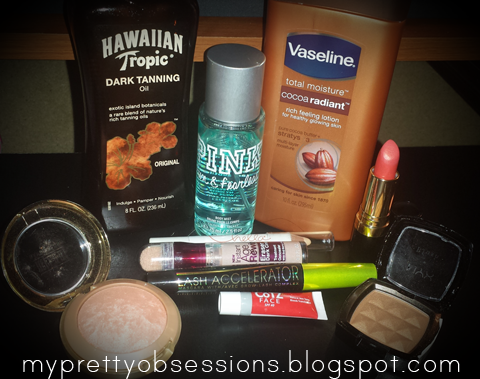 Vaseline products are very affordable and their products work! I love this particular Vaseline lotion the most because it helps me maintain a nice glow for my skin during the summer (really all year round). It is very moisturizing and dries fast leaving no sticky or greasy feeling behind. It has a nice and light cocoa butter scent. I've heard so many great things about this baked blush by Milani, I finally joined the bandwagon to see what all the fuss was about! All I can say is WOW! Milani's baked blush is incredibly pigmented and super soft, it blends beautifully on the apples of my cheeks. The shade 'Luminoso' is a nice peachy pink color. Perfect for a natural look when applied lightly or you can build up your color to give you a more peachy glowy look. I love this little pencil! It's a wonderful highlighter for my eyebrows and I also like to use this to highlight the bridge of my nose. Using my finger, the highlighter blends out very nicely. I really like this concealer because it conceals AND highlights the areas I need all over my face. Some concealers cake up or flake on me, but surprisingly with this concealer, it does not do that. The only drawback that I have with this product is the applicator... I rather dispense the product with a pump instead of twisting and using the same applicator again and again on my face... But since I like this so much, I can overlook it for now. I absolutely love this mascara! Two sweeps for each eye and my lashes are more voluminous and looks fuller without clumping nor weighing down any lash hair! Don't blink too fast after you apply this because product might land right under your waterline and then you'll have to fuss over the cleanup (like I did the first few times I used this lol). This is a wonderful facial sunscreen! Most sunscreens tend to sting on me and it would irritate my skin but not this one! This product is translucent and makes my face feel so soft and velvety. I like to put this on before I leave the house if I'm out with no makeup on. I love to use this blush to contour my face. Unlike my e.l.f. contouring duo, this shade is much lighter and makes my whole makeup look more natural. From time to time, if I'm feeling for more of a subtle look, I'll contour and apply this blush on my cheeks as well. I seriously don't know how many times I've mentioned this lipstick in my blog, but I'm seriously that obsessed with this lipstick! Revlon lipsticks have not yet disappointed me (*looks over at my growing Revlon lipstick collection*) and I hope it stays that way! So that is all of my favorite products for this month! That was quite a bit, but so worth sharing with you! What are your favorite products this month?